We are manfuacturer of All kinds of Pvc Bags- Pvc Boxes which are used widely for packaging in Garment Industry. 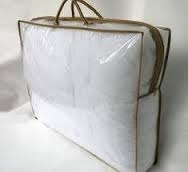 This bag is used for packing Quilts like king size quilt , Queen size Quilt etc. Looking for Pvc Quilt Bags ?